TEHRAN, Iran Iranian authorities used aggressive measures Wednesday in an attempt to halt the nosedive of the country's currency, making arrests, vowing to stamp out sidewalk money changers and warning merchants against fueling the mounting public anger over the economy. There were unconfirmed reports of sporadic violence. Associated Press photos showed riot police blocking a street with the charred hulks of a garbage can and a motorcycle that had been set on fire. 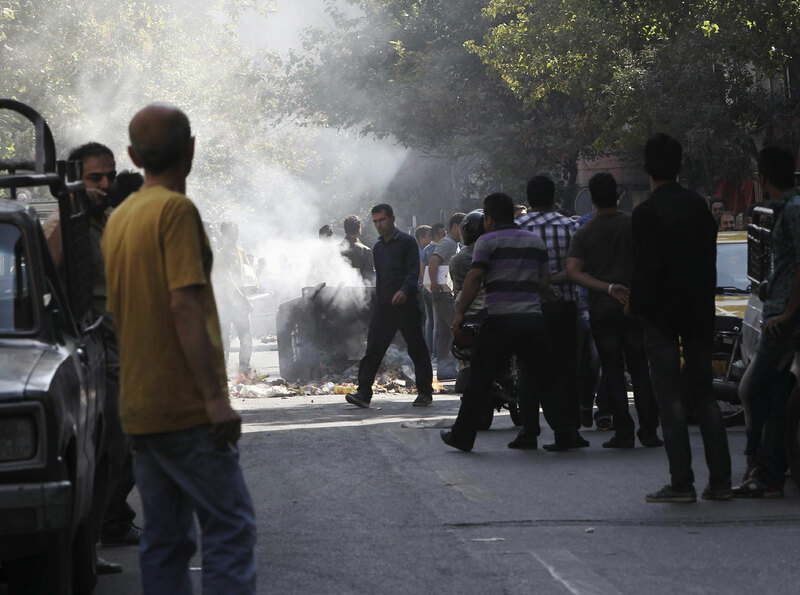 Smoke was rising from the area in central Tehran near the main bazaar. The sweeping responses to the freefall of the rial  which has lost more than a third of its value in a week  underscored the worries for Iranian leaders after months of dismissing the West's economic squeeze seeking to rein in Tehran's nuclear program. A declining currency causes shifts in an economy such as making imported goods more expensive. Although the currency crisis is blamed on a combination of factors  including internal government policies  the rush to dump rials appears to reflect an underlying perception that international sanctions have deepened problems such as runaway inflation and soaring prices for imports and that the only safe hedge is to grab dollars or euros. If the economic turmoil intensifies, it could boost pressure on the ruling system before elections next June to pick President Mahmoud Ahmadinejad's successor. That has the potential to hinder nuclear talks with the West until after the elections. One of Ahmadinejad's main critics, parliament speaker Ali Larijani, has led the calls to blame the currency crisis mostly on allegedly misguided government monetary policies. In reply, Ahmadinejad warned that he could consider resigning if his government is put under too much pressure. "Now is not the time for anybody to settle accounts," Ahmadinejad said Tuesday as the rial hit a record low. "If my presence is a burden on you, (the solution is for me to) write one line to say goodbye." Tuesday's rate of 35,500 rials against the U.S. dollar compared with 24,000 a week ago on the unofficial street trading rate, which is widely followed in Iran. It was close to 10,000 rials for $1 as recently as early 2011. Exchange houses were closed Wednesday, and currency websites were blocked from providing updates on the latest rates. Public grumbling has grown steadily louder over a punishing combination of a falling currency and rising prices, which have put some staples such as chicken and lamb out of reach of many low-income Iranians. Earlier this week, a petition signed by about 10,000 workers was sent to the labor minister to complain that even paying rents has become a struggle. The owner of a furniture showroom said he hasn't made a sale in 10 days while his workshop rent has been increased by 30 percent. He said one of his workers bought a can of tuna for lunch Saturday for 35,000 rials, or about 98 cents at the current exchange rate. The next day it was 45,000 rials, or $1.26, said Hamid, who gave only his first name because of warnings by Iranian officials not to discuss the economic situation with the media. "Even Afghan workers are going home since it doesn't make sense to work in Iran with a currency that's worth less and less," he said. At Tehran's bazaar  the traditional business hub in Iran's capital  merchants appeared to stage widespread closures to protest the stumbling economy. The sprawling bazaar has played a critical role in charting Iran's political course  leading a revolt that wrung pro-democratic concession from the ruling monarchy more than a century ago and siding with the 1979 Islamic Revolution. The semiofficial Mehr news agency quoted police Col. Khalili Helali as saying the bazaar was not officially closed and that authorities will take action against many merchants who have shuttered their shops. "Police will deal with the guilds that have closed their shops to cause (economic) disruption," Mehr quoted Helali as saying. Meanwhile, anti-riot police patrolled streets in central Tehran where freelance money dealers work. Police units also were deployed in key shopping areas. Iran's economy minister vowed to break the black market, which effectively sets the exchange rates. The unofficial market will be "rounded up," Shamseddin Hosseini was quoted as saying by Mehr. The news agency also reported that some arrests were made for attempts to "disrupt the economy" and that at least two "foreigners" were detained for trying to "gather information" about the police action. There were no further details. Iran has placed broad restrictions on foreign media that severely limit the ability for firsthand reporting on the streets. In Washington, Secretary of State Hillary Rodham Clinton said Iran's leaders deserve responsibility for what is going on. "They have made their own government decisions, having nothing to do with the sanctions, that have had an impact on the economic conditions inside the country," Clinton told reporters. She said the sanctions have had an impact as well, but that could be quickly remedied if the Iranian government were willing to work with the international community "in a sincere manner." The West suspects that Iran is using its civilian nuclear program as a cover to develop the capacity to build nuclear weapons. Iran insists its program is peaceful and geared toward generating electricity and medical radioisotopes to treat cancer patients. The U.S. and allies say sanctions and diplomacy remain the best routes to leverage nuclear concessions from Iran even as Israeli Prime Minister Benjamin Netanyahu is appealing for a "red line" that could trigger possible military action. Netanyahu argues that the sanctions have hurt Iran's economy and curbed its oil exports but have not changed what he says are Tehran's intentions to develop nuclear weapons. The causes for the rial's fall draw from many roots. The Western sanctions include blocking Iran from the main international banking networks, which made it difficult for Iranian businesses to borrow money and forced many firms to pay with cash for imports. At the same time, Iran's Central Bank began facing increasing troubles meeting demands for dollars. Sanctions on Iran's oil exports have cut into its foreign currency revenue, and banks in Dubai and elsewhere closed off transactions with Iran. Critics of Ahmadinejad also say his government added to the frenzy to dump rials with policies such as limiting bank interest rates, which led depositors to pull their cash in fear it wouldn't keep pace with inflation. But the intangible elements  the idea that even leaner days are ahead  appeared to kick in this week with consumer prices continuing to rise and rumors abounding that banks would limit withdrawals from dollar accounts. In a sign of the multi-layered theories swirling in Iran, some economists and experts have accused the government of trying to devalue its currency in order to meet its own budget deficit. The government earns more than 90 percent of Iran's overall foreign exchange revenues as a result of oil sales. Higher dollar rates bring more rials into the treasury to pay salaries and fund state programs, such as guarantee stipends to compensate for the withdrawal of fuel and food subsidies last year. Hosseini, the economy minister, challenged the government's critics to provide more than just claims. "We are not after devaluating rial," the semi-official Fars news agency quoted Hosseini as saying. "Those who make such claims better offer evidence."